On December 30th, the 11th Armored Division, with 1st Lieutenant Howard Chilson, ‘41, launched an attack from Neufchateau towards Bastogne, to hold open the highway. Behind them, the 17th Airborne Division moved into position to further reinforce the Bastogne highway. The division seized several towns on their way, and by January 16th, the 82nd Reconnaissance Battalion with 1st Lieutenant Herbert Baker, linked up with elements of the 11th Armored Division, 1st Lieutenant Howard Chilson, just west of Houffalize. (Harmon 1970, 245) The north and south elements of the U.S. Army had begun to close in. His men have taken several hundred prisoners and re-liberated a half dozen Belgian villages in weather that would bother a polar bear. They are back in combat after only three days’ rest following one of the greatest battles of the war – a head-on smash that broke the Rundstedt’s drive towards the Meuse River, kicked back the Nazis 10 miles and practically destroyed a prize SS armored division. 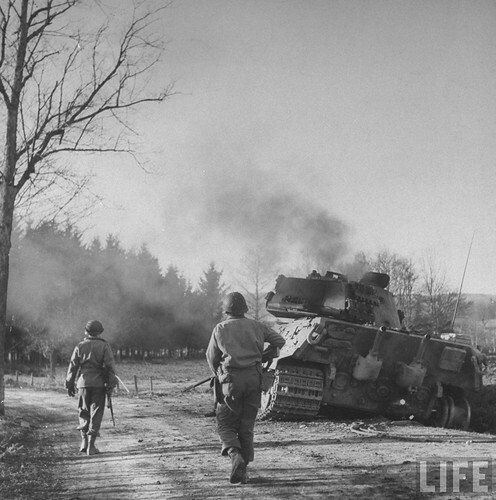 However, by January 9th, German troops began to withdraw, starting with the 6th Panzers, while Patton, armed with the 26th, 35th, 87th and 90th Infantry Divisions, the 4th and the 6th Armored Divisions, and the 17th and 101st Airborne Divisions, pushed ahead. 2nd Lieutenant Arthur Pottle ’44, fighting with the 86th Mechanized Cavalry Squadron in the 6th Armored Division, was ordered to move from the southern-most part of the attack at the German-French borders on Christmas day. The unit arrived on January 1st, where he worked to listen in on the Germans. He helped to set up a listening post near Bastogne ridgeline, with German forces on the other side. He recalled ordering his men to dig foxholes in the frozen ground. Armed only with entrenching tools, they soon gave up. He would continue forward with his unit, noting that the weather was really bad with the ice and snow, and that they weren’t able to be resupplied from the air. At some point, the men in his unit built a large bonfire to ward off the cold, where he ran into a fellow classmate from another division, Hubert Schietinger ’43, as well as fellow 6th Armored Division member 1st Lieutenant Donald F. Wing ’44, of the 15th Tank Battalion. Following the meeting, towards the end of the Bulge, Pottle led his men to check a town. Crossing an empty field, he and his men discovered they had come across a minefield, and continued across, losing two soldiers in the process. The Germans promptly surrendered once they had reached the edge. At this point, the 101st Airborne and 4th Armored Divisions were moving up to Noville, pushing past Bastogne, taking it on January 15th, the day before the 1st and 3rd Armies closed the gap between them. (Eisenhower 1995, 427) The 2nd Armored Division reached the Ourthe River at Houffalize, where they were joined by the 11th Armored Division on the next day. Two days later, the 17th Airborne Division relieved the 11th Armored Division. On the 16th, the Belgian Bulge was considered closed, although it would not be until the 25th of January that the Allied forces returned to their original positions held on December 16th.